Houthis rebels have destroyed Saudi M60 Patton main battle tank and High Mobility Multipurpose Wheeled Vehicle (HMMWV) in Najran province. 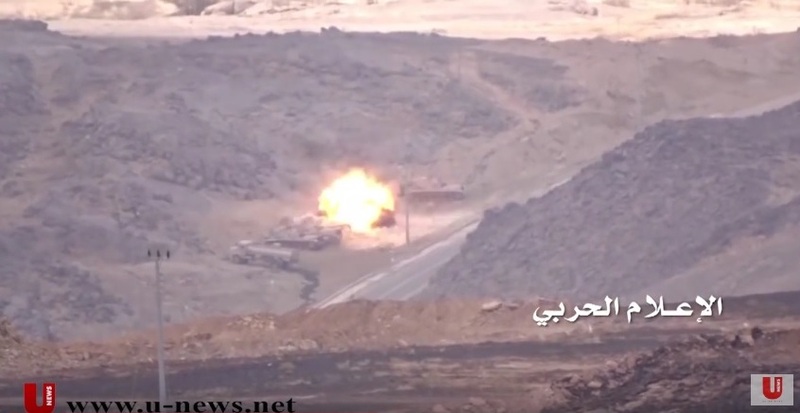 A Saudi M60 Patton main battle tank and a High Mobility Multipurpose Wheeled Vehicle (HMMWV) were destroyed by Houthis rebels in Najran province of Saudi Arabia.
. Clashes between Houthis’ fighters and Saudi border guards usually take place both along the frontier and inside the Saudi territory. About 10,000 people have been killed, since the conflict in Yemen began in late 2014. According to Yemenis, the most part of them have been civilians, killed in Saudi air strikes.